Teshia created Dominance as a homage to the University of Montana Grizzly Athletics. Being a UM graduate herself, she has always desired to paint a special piece as a tribute to her beloved University of Montana & her fellow "Griz" fans. She knew that this piece would have to be significant, in that it would need to radiate a very high level of energy & action, while also capturing a certain uniqueness, allure & magnetism, in order to properly represent the renowned University of Montana Grizzlies. Dominance was created using rich Acrylic paints, intricately hand-painted onto a large, 36"x48"x2", heavy-duty, wooden panel-board "canvas". Teshia began this piece by first painting a striking metallic-silver background, which transitions into a deep black border that extends over the 2" deep edges. 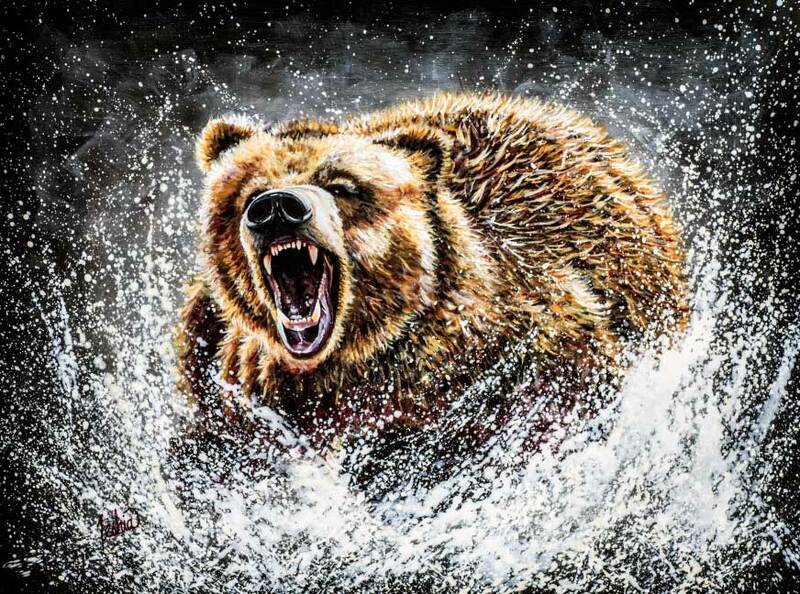 The grizzly bear itself is comprised of rich brown, blonde, crimson, maroon & charcoal hues, & is shown bursting from the water in a manner that can only be described as.... Dominance. The Original Dominance Painting was donated by Teshia to the GSA Montana Wine & Beer Festival on 10/25/13 in Missoula, MT. The Original Painting was SOLD there to a Private Collector. Proceeds from the Original Dominance benefitted the University of Montana Grizzly Scholarship Association.